PwC released a report targeting one of the most popular topics nowadays - how can you incorporate AI in your business and what benefits and threats might await you. This report will address some of the important questions that business leaders have about the investment in AI, what downsides it might have and how can they maintain the confidence of the clients and shareholders. The analysis carried out by PwC reports the economic potential for AI between now and 2030, including for regional economies and eight commercial sectors worldwide. The most recent research showed an increase in global GDP by 14% by 2030 as a result of AI – the equivalent of an additional $15.7 trillion – making it the biggest commercial opportunity in today’s fast changing economy. The greatest gains from AI are likely to be in China (boost of up to 26% GDP in 2030) and North America (potential 14% boost). From the personal assistants in our mobile phones, to cyber protection that lie behind more and more of our commercial interactions, AI touches almost every aspect of our lives. And it’s only just getting started. 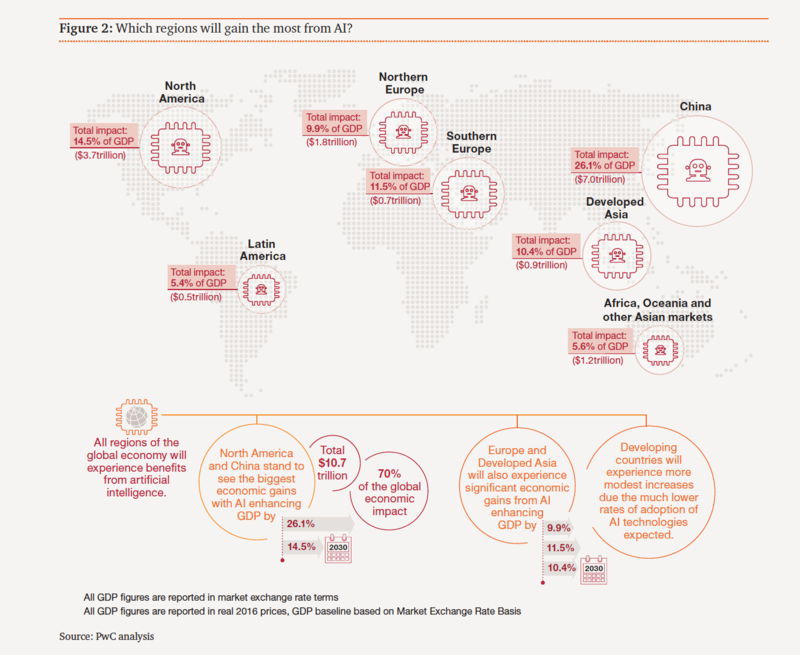 In this report PwC highlights 8 sectors for the AI incorporation - healthcare, automotive, financial services, transportation and logistics, technology, communications and entertainment, retail, energy and manufacturing. According to PwC analysis, healthcare, automotive and financial services are the top 3 sectors with the greatest potential for the AI implementation. Nevertheless, there is also a significant potential for competitive advantage in specific and other sectors, from production on demand to more precise content-targeting for entertainment purposes. The adoption of ‘no-human-in-the-loop’ technologies will mean that some posts will inevitably become redundant, but others will be created by the shifts in productivity and consumer demand emanating from AI, and through the value chain of AI itself. In addition to new types of workers who will focus on thinking creatively about how AI can be developed and applied, a new set of personnel will be required to build, maintain, operate, and regulate these emerging technologies. For example, same day delivery and robotic packaging and warehousing are also resulting in more jobs for robots and for humans. All of this will facilitate the creation of new jobs that would not have existed in a world without AI. 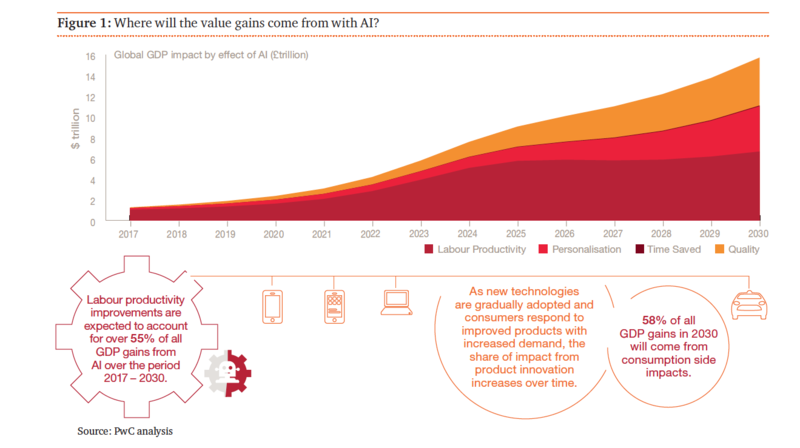 PwC’s results show the economic impact of AI only – the results may not show up directly into future economic growth figures, as there will be many positive or negative forces that either amplify or cancel out the potential effects of AI (e.g. shifts in global trade policy, financial booms and busts, major commodity price changes, geopolitical shocks etc). PwC’s economic model results are compared to a baseline of long-term steady state economic growth. The baseline is constructed from three key elements: population growth, growth in the capital stock and technological change. The assumed baseline rate of technological change is based on average historical trends. It’s very difficult to separate out how far AI will just help economies to achieve long-term average growth rates (implying the contribution from existing technologies phase out over time) or simply be additional to historical average growth rates (given that these will have factored in major technological advances of earlier periods). These two factors mean that our results should be interpreted as the potential ‘size of the economic prize’ associated with AI, as opposed to direct estimates of future economic growth. In North America, the potential uplift to GDP from AI will be amplified by the huge opportunities to introduce more productive technologies, many of which are ready to be applied. It is likely to see the fastest boost in the next few years. While the impact will still be strong from the middle of the 2020s, it probably won’t be quite as high as in the earlier years. One of the main reasons is that as productivity in China begins to catch up with North America, this will stimulate exports of AI-enabled products from China to North America. The high proportion of Chinese GDP that comes from manufacturing heightens the potential uplift from introducing more productive technologies. It is likely to take some time to build up the technology and expertise needed to implement these capabilities and therefore the GDP boost won’t be as rapid as the US. But in around ten years’ time, the productivity gains in China could begin to pull ahead.A key part of the value potential comes from the higher rate of capital re-investment within the Chinese economy compared to Europe and North America, as profits from Chinese businesses are fed into increasing AI capabilities and returns. AI will also play an important part in the shift to a more consumer-oriented economy on the one hand and the move up the value chain into more sophisticated and high tech-driven manufacturing and commerce on the other. An acceleration in talent development in areas such as analytics will be crucial in realising the potential gains from AI within the Chinese economy.